Growing up I hated cauliflower (I know, I was pretty stupid but what can I say?) But as I got older my taste changed, now I love it and can't get enough of it. And this recipe is one of my favorites, you can't go wrong with bacon and cheese. 1/2 cup shredded Jarlsberg or mild Swiss cheese. Wash cauliflower. Trim and cut into flowerets. Drop into boiling salted water and cook 10 min. or until just barely tender. Drain and place into serving dish. Keep warm. Meanwhile fry bacon until crisp over medium heat. Drain and keep warm. Prepare Cheese Sauce: Melt 3 Tbsp. butter or margarine in heavy saucepan. Stir in 3 Tbsp. all-purpose flour. Cook over medium heat, stirring for 2 min. Slowly whisk in 1 1/2 cups warmed milk and heat, stirring, until mixture boils. Whisk until smooth. Add 1/2 cup whipping cream, 1 tsp. salt, 1/2 tsp. black pepper, 1/8, tsp. nutmeg and 1/2 cup shredded Jarlsberg or mild Swiss cheese. 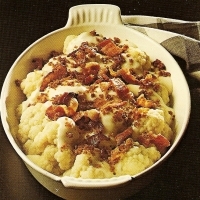 Pour over cauliflower and top with bacon. Serve immediately. To prepare ahead: place cooked cauliflower into buttered ovenproof or microwaveproof dish. Top with sauce and bacon. Cover and refrigerate. Reheat at 350°F for 20 min. or until heated through, or place into microwave oven for 5 min. on High power. Made this for supper and it was delicious. I used sharp cheddar though since its all I had. I also sauteed the cauliflower in the leftover bacon grease while making the cheese sauce. Great meal and I have tons of cheese sauce leftover for something else. Soooo right, you can never go wrong with bacon and cheese... ha ha ha. I also hated cauliflower as a child (most of vegetables I must say), now I DO love all of them. This is a so versatile recipe that I think I could use with almost any kind of veggies. Will try with my favorite cheese, mature Cheddar. Thanks for the post. It also gets my 5. Just goes to show you that with the rite recipe even a vegetable we hated as a child can be redeemed in such a recipe as this Cauliflower With Bacon And Cheese Sauce. I despised cauliflower as a kid too, but oh so glad I outgrew that phase. Look what we were missing out on. Love the stuff. This recipe sounds fantastic. I'm making this tonight for dinner. Thank you for a wonderful post. You have my 5. Like craftyazgirl's recipes? Never miss an upload!